Welcome back to the Ray Pest Control blog! 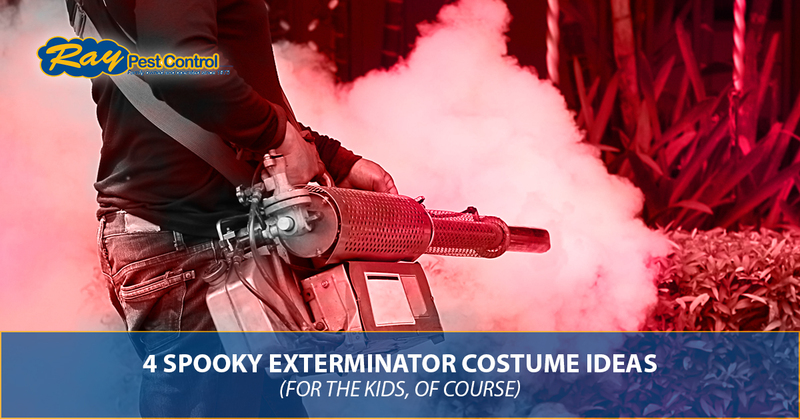 With Halloween on the horizon, we thought we’d have a little bit of fun in today’s post and share with you some of our favorite exterminator-themed costume ideas (for the kids, of course). With all the Spidermans, Captain Americas, Disney princesses, and ever-present Star Wars costumes that will be making an appearance at all the Halloween parties, we think there are plenty of awesome exterminators featured in classic movies who would also make excellent costumes. Let’s take a look at our top picks. Remember, if you have unwelcomed creepy crawlies or spooky furred rodents creeping around your home, call your Top Rated Local® pest control company in Piedmont. The Ray Pest Control team will scare off those pests and rodents while keeping them from coming back. If you read our last post, we talked about this classic 90s comedy-thriller starring John Goodman as the save-the-day bug exterminator, Delbert McClintock. His opening scene sets the stage for his no-nonsense, cowboy-esque approach to pest control in his town that gets taken over by manhunting spiders from Venezuela. He’s the quickest draw in the West with his bug-killing wand sprayer. Spoiler alert! Delbert saves the day when he sets the main killer spider on fire with a flamethrower in the epic final battle between man versus spider. Who can forget this insanely awesome 90s sci-fi adventure film, where a mishmash team of young Mobile Infantry cadets must save future Earth from an invasion of Bugs from outer space. These giant, angry, terrifying alien insects are out for blood in their attempt to take over the galaxy, one planet at a time. But the Bugs don’t stand a chance against the youthful, hormone-driven kids leading the Mobile Infantry. These guys are future pest control technicians at their finest, saving the planet by destroying Bugs with each and every blast from their arsenal of bug killing equipment. All we really had to say was Will Smith. His character in Men in Black is a funny, dapper, smooth-talking secret government agent, who is, essentially, an undercover, large-scale pest control technician. Agent Jay, along with his partner, Agent Kay, are out to get those crazy bugs from outer space causing trouble on Earth. There’s not much more that needs to be said for this costume, except it would super awesome and you’d look darn good dressed as Agent Jay. You simply can’t go wrong dressing up as one of the funniest characters in classic comedy movie history. Bill Murray’s hilarious character, Carl Spackler, is out to get that adorable yet destructive dancing gopher who is constantly tearing up the super ritzy golf course. While he’s not an actual exterminator, he is determined to take care of that adorable gopher. These are some of the funniest exterminator characters in movies, all of which would make excellent Halloween costumes. When you need the assistance of a real pest control company that is determined to eliminate your pest problem, call the experts at Ray Pest Control in Piedmont. From all of us at Ray Pest Control, we wish you a happy and safe Halloween!